You might think I’ve gone mad when you see that these cupcakes are made with pumpkin and avocado! But just wait until you try them and then realise that you can sneak these into the kids under cover as treats. Use goat’s butter or coconut oil in place of butter to make dairy free version and be sure to use gluten-free flour and baking powder if needed. For an egg-free recipe, mix 3 tablespoons of chia seeds with 9 tablespoons of water in their place. * This recipe makes 12 cupcakes. Preheat the oven to 200oC/gas mark 6. Line a 12-hole muffin tin with paper cases and set aside. Melt the butter in a small pan on the hob or in the microwave and set aside to cool. Beat the eggs in a large bowl, then add the banana and mash with a fork. Add the pumpkin, maple syrup, orange zest and cooled melted butter and mix well together. Toss the ground almonds, flour, cocoa powder and baking powder together in a large bowl. Pour the wet ingredients in and mix until evenly combined. Divide the batter evenly between the paper cases, then pop into the oven to bake for 25 minutes, until cooked through. Remove the cupcakes from the oven and leave to cool completely. Meanwhile, prepare the topping. Scoop the avocado flesh into a mini blender. Add the cocoa powder, maple syrup and orange zest and blitz to make a thick, silky smooth mousse. Spoon into a piping bag with a star nozzle and pop in the fridge until ready to use. (This can be made up to two days in advance). Pipe the topping on top of each cooled cupcake and finish with a cat cupcake topper and a pinch of sprinkles. 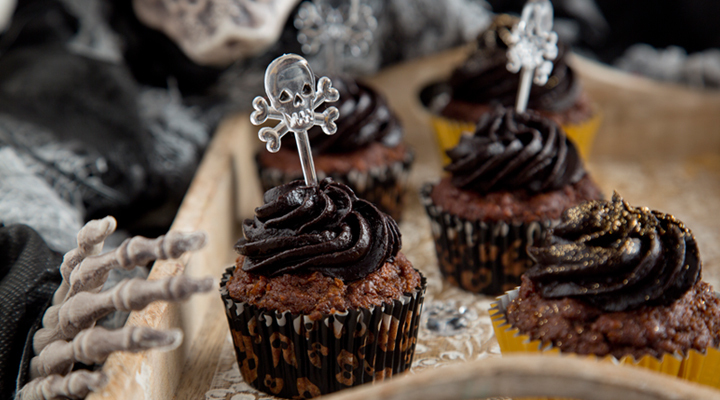 Tip: These aren’t just for Halloween – you can make them at any time of the year. When unavailable, substitute the pumpkin for butternut squash or carrot. The topping actually makes a really quick, sin-free dessert of its own. Try flavouring it with brandy, chilli or even coffee (for more adult flavours) instead of orange. Simply spoon or pipe into small glasses or espresso cups and serve topped with a fresh raspberry or a crumbled amaretti biscuit or with a shortbread biscuit on the side.